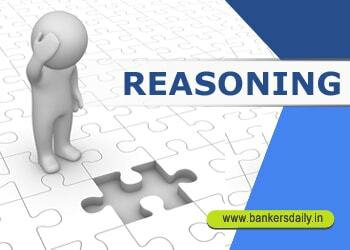 Seating Arrangement Questions and Linear Arrangement questions are one of the easiest way to get marks in the reasoning section, but in the recent IBPS Clerk Prelims Exam, Reasoning section was the easier when compared to the other two exams. 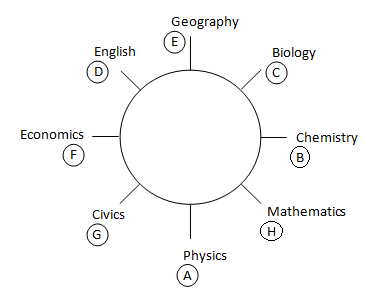 Solve the Given Circular and Linear Arrangement seating arrangement problems which could make your problem solving quicker in the exams. So attend these questions and prepare well for your IBPS CLERK PRELIMS EXAM 2017. D.1-5) Study the following information carefully and answer the given questions. Eight persons A, B, C, D, E, F, G and H are sitting around a circular table facing inside the center. Each person likes different subject viz. Chemistry, Biology, Geography, Civics, Economics, English, Physics and Mathematics. C sits third to the right of A. One person sits between C and one who likes English. Three persons sit between B and F. One who likes English and one likes Economics are immediate neighbours. H likes Mathematics and sits third to the right of one who likes Economics. B sits immediate left of C. One who likes Biology sits between one who likes Chemistry and Geography. One who likes Physics and one who likes Geography are facing each other. E sits third to the left of G. G and one who likes Physics are immediate neighbours. Q.1) Who among the following persons sits second to the right of G? Q.2) Who among the following persons sits exactly between E and B when counted from left of B? Q.4) Who among the following persons likes Civics? Q.5) Which of the following statements is true? D.6-10)Study the following information carefully and answer the questions given below. Eight persons G, H, I, J, K, L, M and N are standing in a row. Some of them face north and some of them face south but not necessarily in the same order. G and H do not face same direction. Not more than two person are standing together do not face same direction. Three persons are standing between K and I, both of them do not face same direction. G is not standing any of the extreme ends. Not more than four persons face south direction. Either K or I is standing at one of the extreme ends. Two persons are standing between L and M who is immediately next to I. L and M are facing the direction as I. J and N are immediately standing to each other and both of them do not face same direction. H is standing third to the left N. G is second to the left f H.
Q.6) What is the position of G with respect to N? Q.7) Who among the following persons are immediately standing with L? Q.8) Who among the following persons are standing at the extreme ends? Q.9) How many Persons is/are standing between H and J? Q.10) If all of them are standing in alphabetical order from right to left then, how many of them will remain unchanged? can’t find the answer to the above puzzles! is there any links which would give answers?